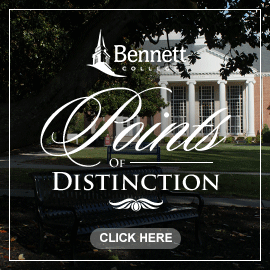 Bennett College, as a United Methodist related institution, is constantly striving to emphasize the acquisition of moral and spiritual principles and to promote faith development. We are committed to helping today’s young woman answer the questions of life: “Who am I and what does it mean to be in the world?” Partnering with faculty, staff, community churches, other college communities, and other agencies beyond the local church, Bennett seeks to encourage a new generation of gifted young women to cultivate academic, social, and leadership skills, along with spiritual gifts. It is the goal of the College to promote interaction with the local faith community to ensure a safe and supportive environment where students can express and nurture their faith.